As you will know from News coverage and social media, inappropriate videos/challenges are being shared with young people over the internet. This is a nationwide problem, which we wanted to make you aware of. ‘The Momo Challenge’ includes a terrifying character threatening young people to complete a challenge, and the video is usually hidden amongst a seemingly harmless video on YouTube. The challenge often involves self-harm. 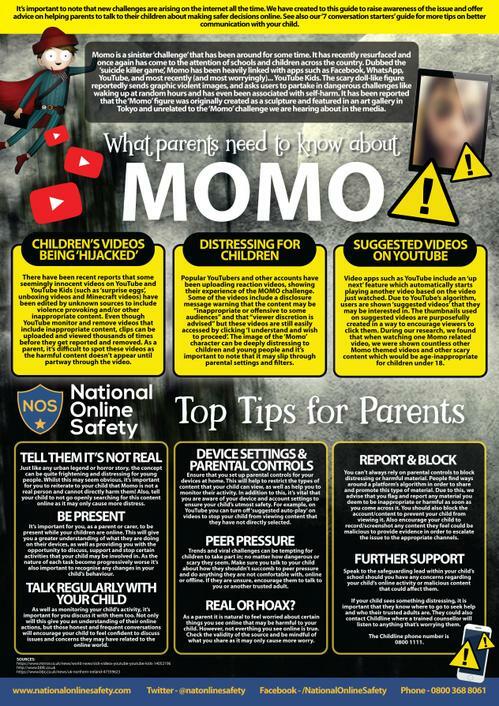 We have shared a guide for Parents about ‘The Momo Challenge’ so please visit this for information. Our advice is to monitor what your child is doing online, talk to your child about basic internet safety and report any inappropriate videos that you find. Please also ensure you have parental restrictions in place. The school has strict internet filters which block pupils in the school from accessing such videos, as we continue to keep our young people safe online.